Check out these perfect San Marzano tomatoes! We found them a few weeks ago at the market and could not pass them up. San Marzano tomatoes are our favorite for making sauces. The name refers to both the type of tomato and the place where they are grown. The variety is known for its oblong shape, and could be grown anywhere tomatoes grow. The San Marzano D.O.P. refers to a regulated region in Southern Italy where the best San Marzano tomatoes are grown. Most San Marzano tomatoes grown domestically come from California. We’ve made really good sauces with these (the 12 pack is a pretty good deal for stocking your pantry) and these. For certified D.O.P San Marzano tomatoes from Italy, we’ve used these. The huge can would make a great weekend cooking project, just make a lot of sauce, divide the it into ziplock bags and freeze it. We also highly recommend these from Cento. Whole peeled tomatoes always seem to be more flavorful, you’ll just need to crush them, either by hand or with a food mill or tomato crusher. If you are lucky enough to come across fresh San Marzano tomatoes, you can make them into a great sauce yourself. All you need to do is cut the tomatoes in half, toss them in a pot, and simmer them with some garlic and basil until they break down, then run the sauce through a food mill to remove the skins and seeds. 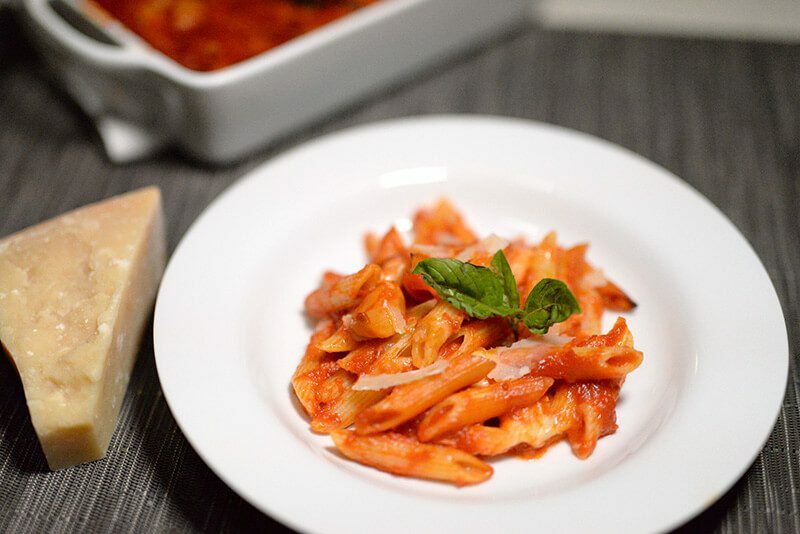 We paired our fresh tomato sauce with one of our favorite southern Italian pasta shapes, Calamarata. It’s a small tube-shaped pasta. It really does resemble Calamari rings. We’ve used this brand and this brand, and both are good. We’ve actually had a hard time finding it in San Francisco, so if you see it around town let us know! 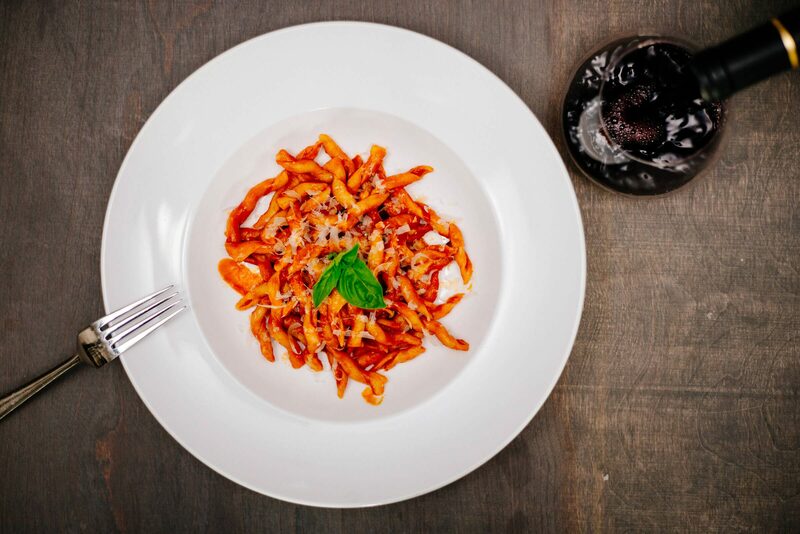 You can learn more about pasta shapes and pairings in Geometry of Pasta. What would a classic southern Italian pasta, with classic southern Italian tomatoes, be without a southern Italian serving bowl? It would still be good, but a colorful bowl is such bright and festive addition to the dinner table! Ours is from Ravello. If you visit, make sure to check out Pascal. They have the most beautiful and intricate designs. We can’t wait to go back! For something easy to get online, we love this bowl from Luisaviaroma (they have really cool stuff, check them out!) and this one as well. Pour olive oil to a small stockpot or large saucepan (we used this one), just enough to coat the bottom of the pan. Rinse the fresh tomatoes and cut them in half lengthwise. Add to the pan and place over low heat. Add the garlic to the pan, along with a pinch of sugar (you can add more later if needed) and a few sprigs of fresh basil. Sprinkle the tomatoes with sea salt and cover the pan. Allow the pan to come to a low simmer and let it simmer for 30 minutes, or until the tomatoes are very soft and broken down. Process the sauce through a food mill and adjust the seasoning for salt and sugar. Bring a large pot of salted water to a boil. Add the pasta and cook for 2 minutes less than the package instructions indicate. Drain the pasta and reserve ½ cup of pasta water. Return the pasta to the pot, along with the reserved tomato sauce and a splash of the pasta water. 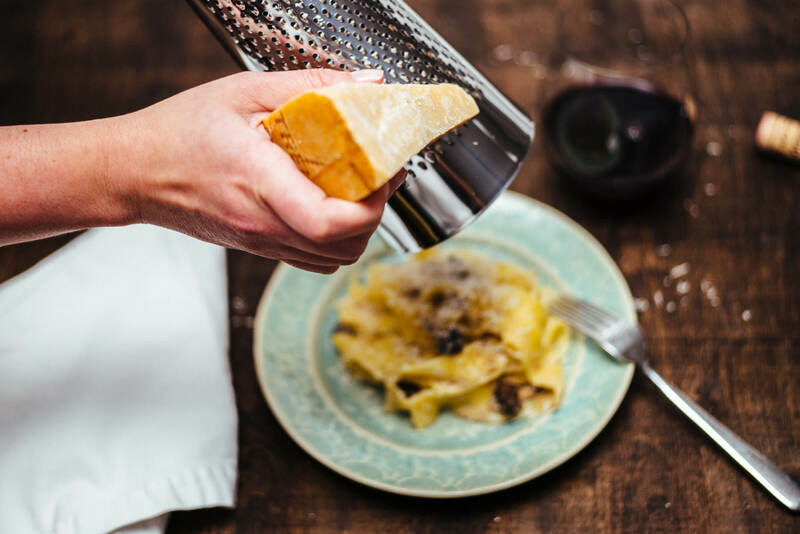 Bring to a simmer until the pasta is perfectly cooked, and serve immediately with freshly grated cheese or, for a vegan option, some fresh chopped basil.